With the release of the 10th book in the Weird But True! main series, things just got WEIRDER and it’s time to celebrate! One of the things we have always loved about the National Geographic Kids Weird But True! books is that they don’t have to be read from start to finish like a chapter book. You can open them up anytime you have a few free minutes to any page for some fun and amazing facts. With topics like science, space, weather, geography, food, pop culture, and just about everything else you can think of there's something that will peek all the kiddos interests. Curious what's inside? Here's a little fun fact out of one of the books: 99% of people can’t lick their elbows — but 90% of people who read this will try! Be honest you're thinking about it right now aren't you? I know I did! • Weird But True! 10 (ages 8-12, $8.99) is the latest release in the main Weird But True! series and books 1-9 has been refreshed and expanded to include 50 MORE facts than the original releases (that’s 350 facts per book if you are counting!)! Did you know that ears are self-cleaning, or that itching is contagious? It's all totally weird ... but true! Each of the ten books of this main series contains 350 surprising and amazing facts about topics like science, space, weather, geography, food, pop culture, and just about everything else under the sun, presented with fascinating photos and illustrations. • Weird But True! Know-It-All Greek Mythology (ages 8-12, $12.99) - The newest in the WBT book family, WBT Know-It-All focuses on a specific topics structured into profiles. Weird But True! Know-It-All Greek Mythology includes everything kids need to know about all their favorite Greek gods, heroes, monsters, quests, muses, and famous philosophers. From who gave mankind fire to famous fatal flaws to who stood guard at the Underworld, this book includes all the iconic Greek myths and key characters — and then goes one wonderfully weird step beyond. • Weird But True! Cool and Crazy Sticker Doodle Book (ages 8-12, $12.99) - Get ready for even more DO-IT-YOURSELF weirdness in the latest Weird But True! Sticker Doodle title. With each turn of the page kids learn new information and get to try new wacky activities, from doodling prompts to crosswords, mazes to picture puzzles. This book unleashes kids' creativity in a uniquely Nat Geo Kids way. Discover amazing weird facts and then doodle, draw, or color away right on the page. Did you know that some American soldiers once rode camels instead of horses? Draw some other unexpected animal mounts! Did you know that some ice-cream trucks serve scoops just for dogs? Create some other gourmet masterpieces for your canine companion. Enhance your wacky masterpieces with 150 fun stickers included in the book. Let your kids’ creativity run wild for hours on end in this perfect boredom-buster for rainy days, car rides, or any time. • Weird But True! Christmas ages (8-12, $8.99) - A bit different than the main Weird But True! series, this title is focused on one theme — spreading holiday cheer with festive far-out facts about Christmas! Makes a terrific stocking stuffer. And if the books aren't enough to keep your kiddo entertained be sure to check out the Weird But True! website. There you can find videos, games, and lots more educational and entertaining content. 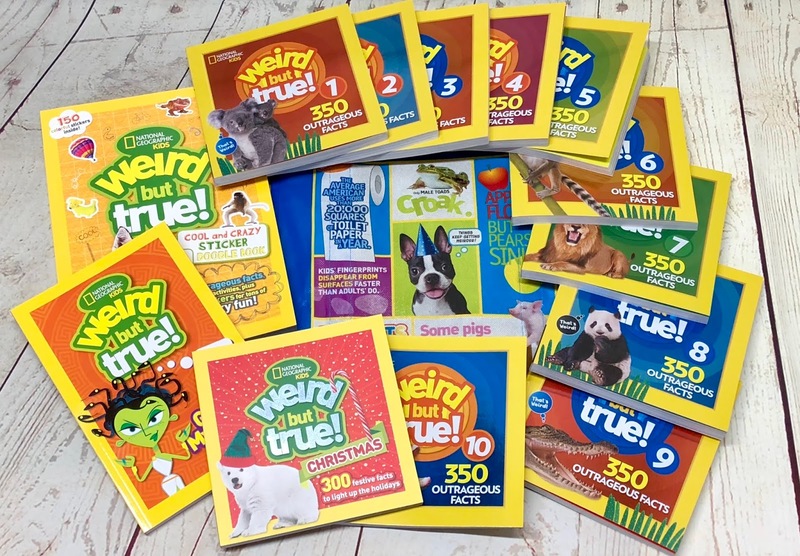 Win it: One lucky reader will win a National Geographic Kids Weird But True! Mega Prize Pack (ARV $130). Prize pack includes: Weird But True! books 1-10, Weird But True! Know-It-All Greek Mythology, Weird But True! Cool and Crazy Sticker Doodle Book, Weird But True! Christmas, and a handy Weird But True! bag to carry this big haul of books! This giveaway will end November 30th at 11:59 PM EST. The winner will have 24 hours to respond to my email. If no response, a new winner will be chosen. Prize fulfillment will be made by the sponsor, I am not responsible for prize delivery or lost or stolen deliveries. Open to residents of the US. One weird but true fact is that snakes can help predict earthquakes. I had to look one up: snails have 14,000 teeth. No i don't know any. Sorry I don't know any wier fact. Did you know that Monarch butterflies have even been found to travel over 250 miles in one day! So far for such a small creature!!! I know that crows remember faces and will bring other crows if they feel like you've wronged them! Warmer weather causes more turtles to be born female, rather than male. Ohio gives out different colored license plates for those that are convicted of a DUI, yellow. I had to look one up too, i just couldn't think of one. Even though Fruit Loops are different colors, they all have exactly the same flavor. The boomslang snake’s venom causes you to bleed from all holes of your body. Spider silk has been made to use violin strings. No, sorry, I don't know any. Babies have 270 bones while adults have 206. Cats nose prints are like human fingerprints! Each one is different. Weird but true; Female ferrets can die from being in heat if not bred or spayed. i do not but my kids probably do. Thank you for the chance! I don't know of any off hand but my kids would love to read and share some interesting facts with me. Just the other day I heard that you can burn more calories while sleeping then being a couch potato! "Do you know any "weird but true" facts? If so share it with us!" You can make diamonds out of peanut butter! I know that you have 206 bones in your body. I can't think of any weird facts. No, I dont know any! I guess I need these books to read about some! i actually just racked my brain and I don't know ANY ! There are two countries that are double landlocked-Liechtenstein and Uzbekistan. You can store a Staples in the bottom of the stapler. The sunsets on Mars are blue. I think that would be so cool to see! I have 4 grandsons who would have fun and learn with these! Apples are part of the rose family and the seeds contain cyanide. A hard boiled egg will spin, but a soft boiled egg will not. No, I do not know any. To tell if your honey is real, you can put a bit in a bowl, add some water and swirl. Pure honey will leave a honeycomb shape. My weird fact is that Octopus die after giving birth! Ultimate sacrafice. I wish I knew one, but would have to go on google and search, I'm sure my grandsons know one tho ha ha! Your eyes are the only part of you that never grows! They're full size the day you are born. Christina O - I don't think so. There is only one seven letter word that cannot be placed on a Scrabble board. The big anglerfish we see on tv are all females. The male is tiny and actually gets absorbed into the female..
Ladybugs can become vicious if food is scarce and can resort to cannibalism. I can't think of unusual facts. I know I know some, but it isn't coming to my brain. I don't know any off the top of my head. But I hope to win so I can pick up some new ones! Maybe not too weird, but...I know that ostriches eat pebbles to digest their food. It would take a sloth one month to travel just one mile. I found out that some frogs glow when they eat fireflies. I use to know some stuff but my memory is going. I don't know any weird but true facts, but would love to win to find some out! There are more fake lawn flamingos than real ones in the world. In the Northern hemisphere the moss grows mostly on the north side of the tree. In the Southern hemisphere the moss on trees grows mostly on the south side. I don't know any "weird but true" facts, but I will if I get this. I found this one online: The colder the room you sleep in, odds are high that you’ll have a bad dream.